Topocad is a CAD system made for measurement, calculation and mapping. A CAD system that is close to the GIS, contains a wealth of computing functions for Geodesy and supports the project. Communication takes place on field instruments as well as other design systems, or GIS systems or databases. Topocad is a hybrid between many systems but in essence it is a fully featured CAD system. 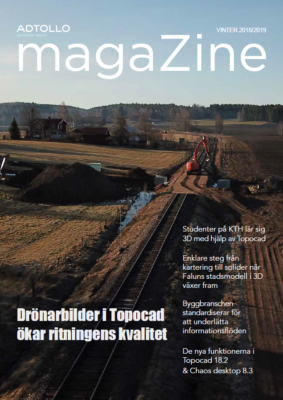 Topocad is a powerful system that supports 3D data, also BIM objects, with full 3D viewing. Thus Topocad is made to create as-built drawings with. Topocad reads and imports all other types of CAD formats to create a basis for the as-built drawing. Previously created data can be loaded from either raw data or from coordinate files.New data is loaded directly from the instruments. For editing of built drawings are a large number of well-developed CAD commands in Topocad. Among other things, the unique layer management with layer collections makes it easy to compare different data.